Experimentally only and do exist. That is, and do not exist in our vacuum as real particles. Does this mean the vacuum consists of , instead of glue2bals? A real would be absorbed by the vacuum then, while would annihilate there, what would be why they don’t exist as real particles. So and would only live until the spin flips. But therefore they need a W+ W- Z0, and those are rare. Would that do? Besides, the sun does show a deficit of electron-neutrinos. Low-energy as wel as high energy neutrinos are both missing, but not in the same amounts. And the observed neutrinos from supernova 1987A? Once freed from their source, all the distance to us they didn’t met any W+ W- Z0 to make their spin flip; is that realistic? The is not a vacuum particle. If it was it would annihilate with the vacuum particle , making this contribution disappear from the vacuum. The is no real particle either. I guess it must have been transformed into something else. But what? The spin down neutrino field is used in my discussion on time reversed gravitation, see item 14 of page 1 in the storyline THE EXPANSION OF THE UNIVERSE. If the vacuum consists of neutrinos only, it would exhibit delay in dragging particles like quarks and gluons because the average reaction time for the strong nuclear force is 10 exp -23 seconds. Neutrinos cannot rival that, see the paragraph Reaction time of the storyline NET FORCE. So this would be the vacuum: two boson graviton fields gl gl (spin +2) and gl gl (spin -2) in superposition with one fermion field (spin -1/2). Or , to end up with spin 1. Or is it a real mix? Gluons and neutrinos don’t couple, so there seems to be no objection. When it is a real mix, the possibility of a spin +2 - 1/2 = spin +3/2 vacuum-particle arises; wasn’t that of interest in supersymmetry? But no spin -3/2. The vacuum does not consist of any state of electrons or quarks, protons or neutrons, or photons, since these particles observably do not disappear into the vacuum. They are stable. But why keep up 10^-23 sec reaction time for the vacuum particles when dragged-by masses don’t react with it? In the previous page, paragraph 4, is suggested that in fact all particles always “react” with the vacuum by means of a multiplication with factor 1 at every moment of existence. Maybe because it confirms the location in space and maybe it causes the transition of the actual moment in time to the next moment in time. Once again I express my strong suspicion about the weak force W+ W- Z0. It is tempting to somehow identify the proposed Higgs particle gl gl with the W+ W- Z0. The W+ W- Z0 are very short-living too, being intermediate states only, like the proposed Higgs boson. In this page, the glue2ball Higgs particle is accompanied by the spin down neutrino: gl gl + or gl gl + . Somehow a mix of the mentioned particles gives the electron its mass. 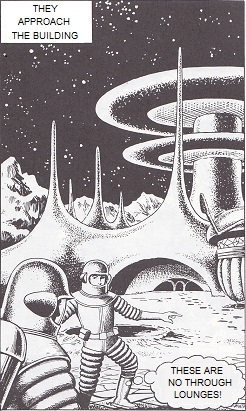 In page 7 of the storyline NEWTON EINSTEIN KIEKENS GRAVITATION I introduced the concept of the missing elements. It suggests how the act-of-giving-mass to the electron also sets its state of motion relative to the Higgs field where “it gets its missing elements from”. And when the Higgs field streams, the induced electron state streams along with it. In doing so it does avoid interaction with the gravitation field, but here that is beside the point then. However, no light is shed on HOW the massive particles take their missing elements from glueball and neutrino vacuum particles. The whole missing element concept first have to be worked out properly. In CERN they increase energy. Here follows a prediction about what they are going to see at CERN. First the graviton and the Higgs particle are glueballs made of 2 gluons. They’re gonna see glueballs. When vacuum energy increases, the following contribution is expected. (+1/6, -1/6, +2/6 are colorshifts.) In the vacuumparticle (+1/6 gl -1/6 gl) the +1/6 gl emits a +2/6 gl that subsequently is absorbed by the -1/6 gl. In fact the gluons split and merge. The gluons swap colorshift. Colorshifts just add, compare the rules below on page 8 of NETFORCES IN QCD, see the SUMMARY. This is not an easy transition. First the orbital impulse momentum of the 2 gluons must rise from 0 to 1. Then, during its flight, the +2/6 gluon takes over the impulse momentum, leaving the original 2 gluons with orbital impulse momentum 0 again. And when the +2/6 gluon is absorbed, the 2 remaining gluons get back their orbital impulse momentum 1. In the case of gravitation (gl gl ) or (gl gl ) the glue2ball remains identical, but in the case of the Higgs field, the (+1/6 gl -1/6 gl ) becomes the (-1/6 gl +1/6 gl ) or vice versa. The gravity field remains the same, but the Higgs field changes. The +2/6 gluon field now has become a vacuum field and can no longer be real. But the +2/6 gl and -2/6 gl are the gluons that keep the quarks together in the baryons! Those gluons now disappear, absorbed as they are by the vacuum and enlarging it with their volume. So, as long as this “pumped up” vacuum exists, the 3 quarks of a baryon are freed. which could recombine to two glue2balls (+3/6 gl -3/6 gl) and (-2/6 gl +2/6 gl), or one glue4ball, or anything. These are all vacuum glueballs. Now ALL gluon fields have become vacuum fields and all quarks are freed. So in the time to come CERN will see three free quarks from the baryon. 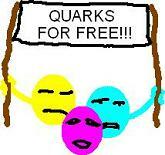 I guess, to free quarks from the meson will need still higher energies, maybe not available at CERN. We replace colors by quaternions, see (1.2) and (1.3) in the storyline QQD. A color can be the color of a quark or it can be a gluon according to the gluon table). What it is depends on other properties of the particle like spin or electric charge. When you have a term that consists of a color times a color, then the first color can hold as (the color of) a quark, but it also can be a gluon. The second term always is a gluon. Colors from quarks don't couple directly, quarks don't couple directly by the strong force. Quarks couple to gluons and those gluons then couple to another quark. According to (2.2) at page 2 of QQD we always right multiply the quark by the gluon, in gluon emission as well as in gluon absorption. So in the term the second color always is a gluon. ( i -i ), ( j -j ), ( k -k ), ( 1 1 ) and ( -1 -1 ). In this table A are the gluons from the mentioned pairs. In B up to G the first factor is always a vacuum gluon and the second factor is the gluon that is emitted or absorbed.